Glam Polish Six Impossible Things is a full coverage holographic glitter with pink glitters sprinkled throughout. This one is so glittery but soft at the same time. It's a beautiful polish. My swatch is shown with two coats and only one coat of top coat. It didn't dry smooth like a crème, but it wasn't textured either. My swatch pictures were taken outside and the sun kept popping in and out. 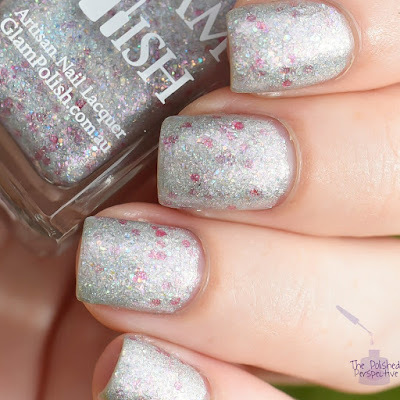 I love these silver holo with different colorful glitters Glam has been coming out with. When I don't have time to do nail art and I want to have a basic crème manicure, I use these polishes as my accent nail. It's like the silver disco ball accent nail with a unique spin. I bought this one because I knew it would look awesome paired with a dark pink crème, plus it's really really ridiculously good looking. I was once asked, "What nail polish brand would make you feel like you made it as an accomplished blogger if they asked you to review their polish?" My answer: Glam Polish and OPI. A girl can dream, right?